Not to be confused with the Maple Island map Maple Tree Hill. 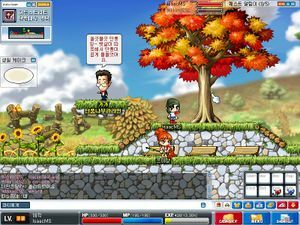 For KoreaMS's fifth anniversary event, the area of Maple Hill was opened. To gain access, talk to the man in the tuxedo, Gaga, located in Ellinia, Lith Harbor, Henesys and other towns. Inside, players can donate "sunlight", in the form of sun-shaped items dropped by monsters, to help the great Maple tree grow. At its tallest point, the tree will explode in a flurry of maple leaves. Some of these maple leaves will be golden, and these golden maple leaves can be exchanged with Gaga for either maple weapons or other rare and valuable items. After collecting a certain amount of sunlight, Gaga will reward you with the "Under the Maple Tree..." relaxer, a chair which, when used, will instantly grant the player with the cool shade of a large Maple tree. In JapanMS, it is currently being used as a spring event. Note: Aramia replaced NPC Gaga in KoreaMS. This page was last edited on 4 March 2014, at 03:08.